The long awaited oral arguments before the Supreme Court on the subject of the constitutionality of the Obamacare legislation are over, and the Justices are securely ensconced in the halls and offices of the Supreme Court conducting their discussions, and at this point, likely drafting a myriad of majority, concurring, and dissenting opinions. Ever since the Marbury v. Madison decision of 1803 in which the Court asserted its authority under the Constitution to rule on the constitutionality of legislation passed by Congress, the three branches of government established in the Constitution have settled into the clarity that the United States Supreme Court has the authority to determine whether legislation comports with, or is in conflict with, the Constitution. Schoolchildren have learned for two centuries or more that Congress, the legislative branch, makes the laws, the Executive branch enforces the laws, and the judicial branch, the court system, interprets and applies the laws. Law school professors honestly do not spend a lot of time on the notion that the Constitution’s provisions must be closely followed, but the basic notion that the Court has the authority to strike down unconstitutional legislation is as established as any law can be. From my days in law school at Georgetown, I have loved the whole majesty of the system established in the Constitution to keep the balance of power spread among the three branches. And I often went to listen to oral arguments at the Supreme Court, which was literally on the walking route between my law school housing and the law school. Cries of “judicial activism” normally come from the conservative side, in response to decisions from the Supreme Court that appear to be more like legislating new law from the bench and less like interpreting existing law. So when President Obama commented last week that it would be “unprecedented” for the Supreme Court to overturn a law that was passed by “a strong majority of a democratically elected Congress,” I had a most unsettled and almost alarmed reaction. His characterization of the idea that the Court might overturn Obamacare as “judicial activism” further frankly astounded me. First, it is the basic job of the Supreme Court to rule on whether laws Congress has passed are consistent with the Constitution, regardless of whether those laws passed by one vote or unanimously. How many Congressmen voted for a particular law is irrelevant to whether that law is Constitutional. What was alarming was that President Obama knows this, so his words were not intended to share information, but to bully and intimidate the Court. This was supremely un-Presidential. Second, this Obamacare law was passed along strict Party lines and in opposition to the clearly known will of the people. Everything about its passage, from the back room deals to the “find out what’s in it after it’s passed because none of us have read it” all signified the worst possible style of legislation, a far cry from the open and transparent legislative process the American people rightfully want and expect. So the President’s characterization was profoundly untruthful. 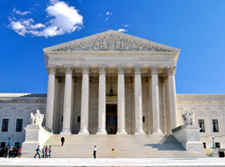 Third, judicial activism is a serious problem, but a decision by the Court to strike down Obamacare if they find it to be inconsistent with the Constitution, particularly the notion that the mandate to buy insurance exceeds the power of the government under the Constitution, would not be judicial activism, but instead would be exactly the kind of ruling the Court should be expected to make. The entirety of the President’s remarks and the tone of those remarks at their core revealed an arrogance of power that was the most unsettling aspect of his statement. In conjunction with his use of unaccountable Czars, and his circumvention of the Congress on key issues and using agencies such as the NLRB and the EPA to enforce what Congress will not pass, combine to paint an unwholesome picture of his view of the power and scope of the Presidency. His response if the Court does strike down Obamacare will speak volumes about his acceptance or rejection of the precious balance of power with which the Constitution has blessed America.